"Hiking & Backpacking Big Sur" Book Event with Author Analise Elliot Heid, Sept. 7th at Florey's! Florey's Books welcomes author Analise Elliot Heid as she discusses her new book "Hiking & Backpacking Big Sur 2nd Edition"
An avid hiker, backpacker, and naturalist, Analise Elliot Heid has pursued an outdoor lifestyle both professionally and recreationally. She currently works as an environmental educator, science teacher, and school garden program director along the California coast. Analise holds a B.S. in forestry from U.C. Berkeley, a M.A. in education from San Francisco State University, and works as a master teacher in the Cal State University Science Teacher and Researcher Program. 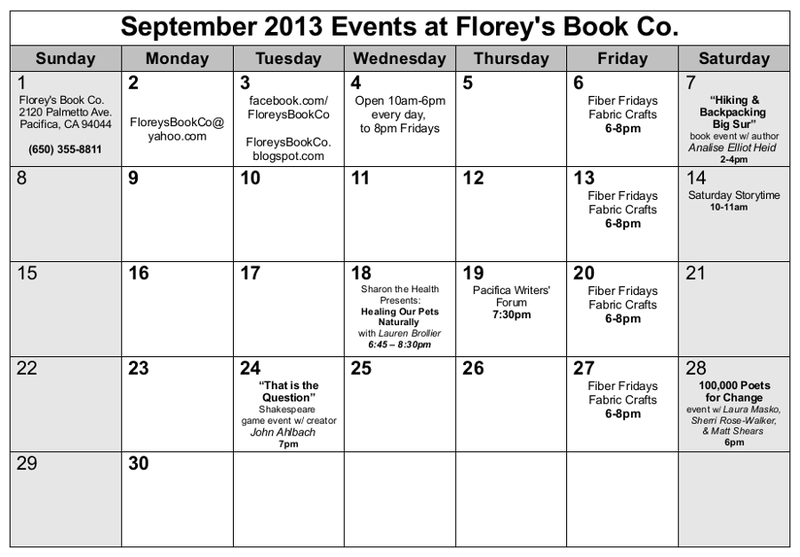 September 2013 Events at Florey's Book Co! 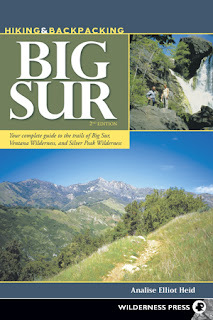 -"Hiking & Backpacking Big Sur"
A fun and informative guide to the outdoors of the central coast. Sept. 19th, 7:30 pm. 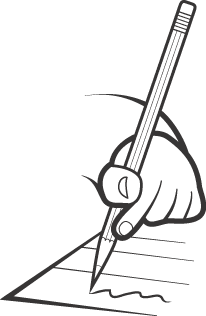 Come and share the joy of writing, reading, and poetry! 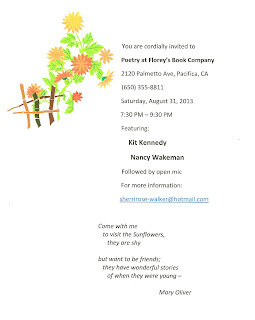 The featured poets this month are: Kit Kennedy and Nancy Wakeman. The featured poets will be followed by an open mic period. Open mic sign-up is first come, first served. This event is also open to the public and free of charge. "A Little Witch in Training" Book Event with Author Michael Romano, Sunday, August 25th at Florey's! 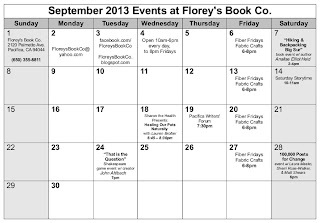 Florey's Books welcomes Pacifica author Michael Romano as he discusses his new young adult book "A Little Witch in Training"
Isabel, an inquisitive and daring 8-year-old, moves with her newly-single Mom from her home in bustling New York City, to the countryside in Massachusetts...Salem to be exact! 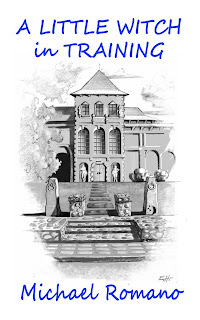 She soon discovers amazing secrets about herself and her new home...and learns of the town's rich and powerful descendants who caused her ancestors such harm. What will happen next? The adventure begins! "Take a Chance" Joyfulness workshop with Kathleen Nelson, Saturday, August 24th, 1pm! Florey's Books invites you to a free joyfulness workshop, hosted by Kathleen Nelson. Join Bay Area teacher, author and musician Kathleen Nelson for a unique workshop on how to bring more joy into your life. 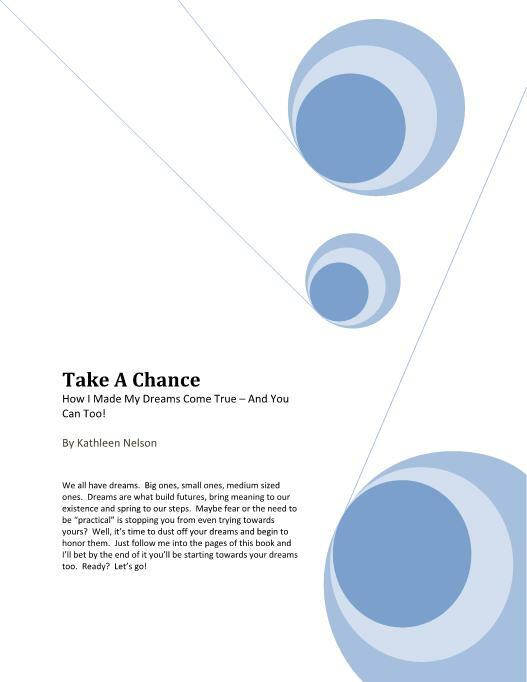 Her new book "Take A Chance" will show you how she took small, practical steps towards making her dreams come true - despite health problems, personal loss, financial ruin and other obstacles - and how you can too. No matter where you are in your life, it is never too late to bring more joy into your days. Kathleen Nelson is a California native. A classical pianist performing since age 6, she developed her introspective songwriting style in her thirties. After her European debut in Vienna, Austria in the 90s, she suffered a series of personal and financial losses and decided to quit performing music for good. She went to work as a legal assistant in Silicon Valley for a decade. Although she continued to teach music, it was years before she found the strength to perform again. Through small, practical steps, she found her way back to music and her joy in life is to encourage others to find their joy. 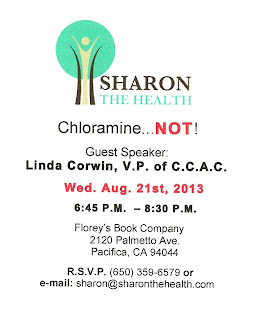 Sharon the Health Presents: 'Chloramine Concerns' Wed. August 21st at Florey's! 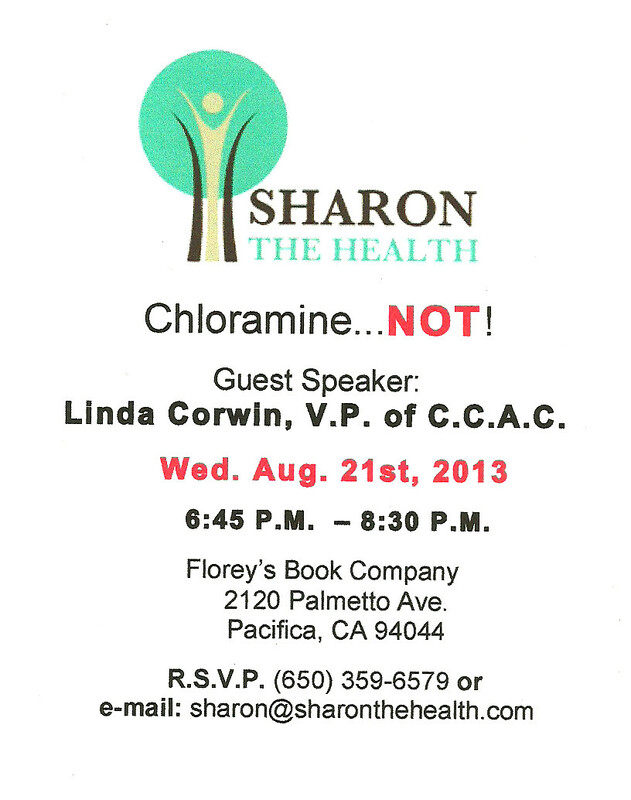 and guest speaker Linda Corwin, Vice president of Citizens Concerned About Chloramine. Ms. Corwin will discuss the health implications of chloramine and other substances that are added to our drinking water supplies. 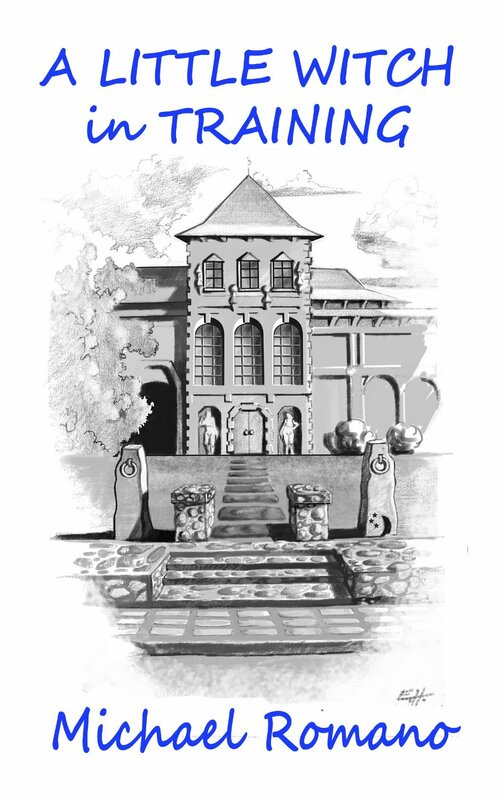 Did you know that a new disinfectant, chloramine, has been added to our Hetch Hetchy water system which has not been properly tested for human consumption and safety? Please attend this lecture for important information. 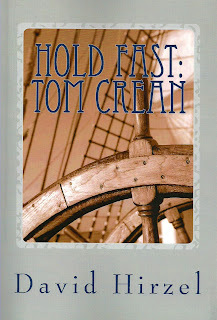 "Hold Fast: Tom Crean" Book Event with Author David Hirzel - Saturday, August 17th at Florey's! Florey's Book Co. welcomes local author David Hirzel as he discusses his new book, "Hold Fast: Tom Crean with Shackleton's Endurance 1913-1916"
It gives me great pleasure to announce the official launch of my new book Hold Fast: Tom Crean with Shackleton's Endurance 1913-1916, at Florey's Books in Pacifica. Many of you will be familiar with my earlier book Sailor on Ice about this steadfast Irishman's adventures in the Antarctic with Robert Scott's assault on the South Pole in 1910. In the days before radio communication, the explorers of the icy southern continent were on their own. When disaster strikes, you want a man like Crean in your team. When Shackleton set out to cross the Antarctic continent in 1914, he had with him this most durable and dependable men, a common man in uncommon circumstances, the one who pulled through no matter how daunting the odds. My new book, Hold Fast continues Crean's story, into the far southern reaches of the sea, where the assault of the moving pack ice sank the ship and doomed the expedition. Unable to make shore, the men lived on the ice until it disintegrated. They made it to the shore of a deserted island, but someone would have to go for help. It meant an open-boat journey over 800 miles of the stormiest seas on earth, and a daring crossing through the high trackless wastes of a frozen island. The men to do it would have to face the deadliest dangers of their lives, and not flinch. Tom Crean was one of those men. Hold Fast is a work of narrative nonfiction based on published and unpublished sources, and interviews with Crean's family, tells the story as seen through Crean's eyes and sharing his experiences as they unfold. 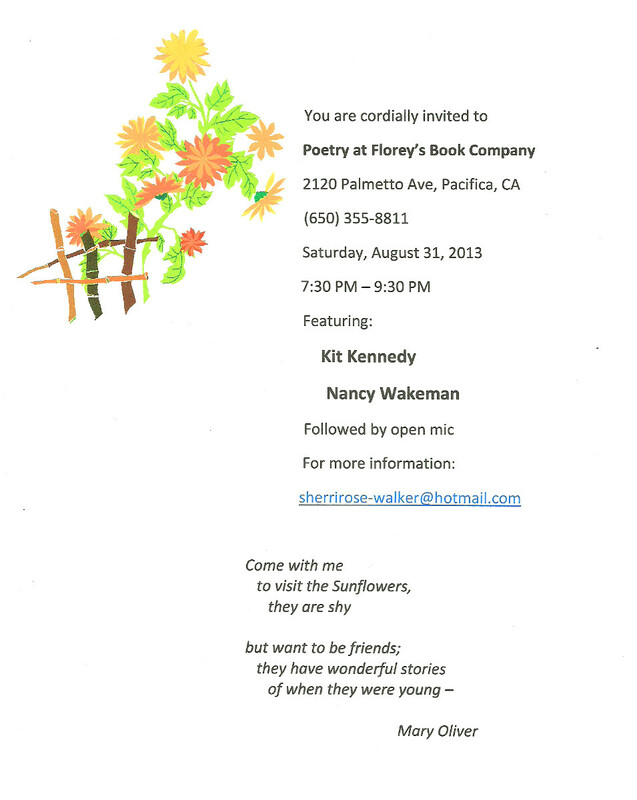 Pacifica Writers' Forum, August 15th at Florey's! "That is the Question" Shakespeare Boardgame Event with Game Designer John Ahlbach, Tuesday August 13th, 7pm! Florey's Books welcomes local game creator John Ahlbach, and we invite you to join in and play his board game: "That is the Question: A Game of Shakespeare Knowledge". 'That is the Question' is a fun journey through all things Shakespeare. The game's 500 questions come with a multiple-choice option that players with less experience can use to level the playing field against those with more expertise. The questions cover the plots, language and characters of major and minor plays. They cover Shakespeare on stage and in film in our own time. Knowledge and educated guessing do not always win in That is the Question. Luck must be with you, too, as you must land on the right spaces to win the two of each type of Character Card needed for victory. So, when Juliet asks, "What satisfaction canst thou have tonight? ", the answer is, play That is the Question with your friends or family! John Ahlbach is a teacher at Archbishop Riordan High School in San Francisco. He wrote the 500 questions used in That is the Question: A Game of Shakespeare Knowledge. The game board and cards were designed by Mona Toft, a graphic artist in St. Paul , MN. Much of the profits from this game will go to Friends: The National Association of Young People Who Stutter, of which John is a co-founder. 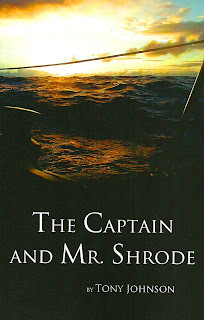 "The Captain and Mr. Shrode" Book Event with Author Tony Johnson, Saturday August 10th, 2-4pm! 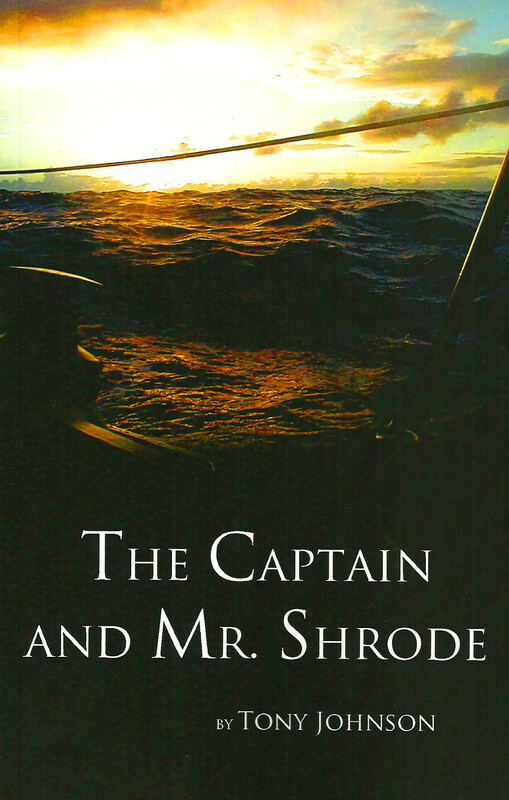 "The Captain and Mr. Shrode". During their two-and-a-half-year circumnavigation aboard the sloop Maverick, Tony Johnson and Terry Shrode survived a number of harrowing engagements with the forces of nature. In Tahiti, a midnight gale caused Maverick to fetch up on a dangerous coral reef. In Indonesia, faulty navigational charts, heavy winds and high seas led the crew to run the boat aground. And thirty miles from a safe landfall after a twenty-one day Atlantic crossing, water in the bilge triggered the discovery that the hull had begun to tear itself apart. Only a heroic effort by the skipper and first mate kept them from sinking within sight of land. Along with tales of adventure, the Captain's chronicle contains accounts of natural wonders including orangutans in the wild, observed on a dreamlike jungle excursion up the Kumai River in Borneo, and the nighttime Arabian Sea glowing ghostly white from horizon to horizon, the result of a rare bloom of phosphorescent plankton. Woven through the journal are revealing and sometimes surreal encounters with a host of fascinating characters including native guides, fellow cruisers, and would-be pirates. These cross-cultural experiences assume added poignancy in the period following the World Trade Center attack, when, despite the warnings of family and friends, Tony and Terry decide to carry on with their voyage through the heart of the Islamic world and fly the American flag. Sections on Odysseus, Drake, Columbus, Plato, Socrates, bullfighting in Spain, Mediterranean geology, and Junior Walker and the All-Stars ensure that the book will satisfy the reader's wanderlust for cultural and intellectual, as well as nautical, adventure. Saturday Story Time at Florey's! 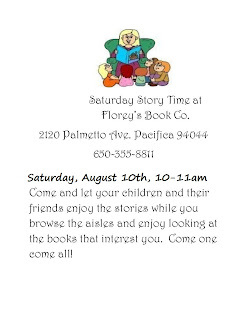 August 10th, 10-11am!